Sand Springs, Ok. — A Cub Scout camp located in the heart of one of Oklahoma’s largest ranches is expanding its facilities and recently installed a new polyethylene (PE) sewer line. The camp is called Cub World and has become a big part of the thirty-two thousand acre Zink Ranch which is located about fifteen minutes from the city of Tulsa. The ranch is a non-profit organization and about 100,000 kids from the Boy Scouts, Girl Scouts and Cub Scouts visit the ranch each year. The sewer line that is under construction is for a restroom facility that will service a new theme park for Cub World. A fishing pond has been drained and a stationary ship is under construction that will sit in the middle of the pond and serve as a fishing platform after the pond is refilled and stocked with bluegill. The sewer line will run from a new restroom at the fishing pond to an existing lagoon, 3,500 feet away, that serves several other restrooms. With heat-fused joints the piping system becomes a leak free monolithic structure and there is no chance for seepage or ex-filtration into the surrounding soil. 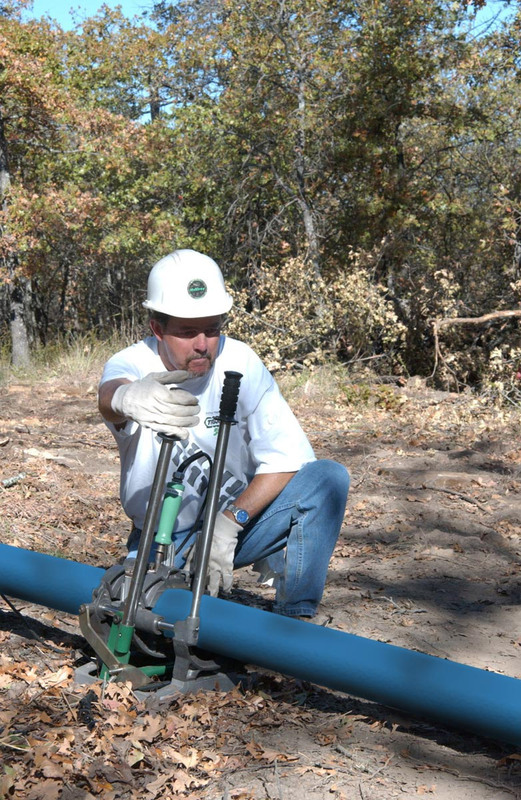 A no leak system is crucial because the ranch has 40 miles of shoreline on two major lakes in the area. 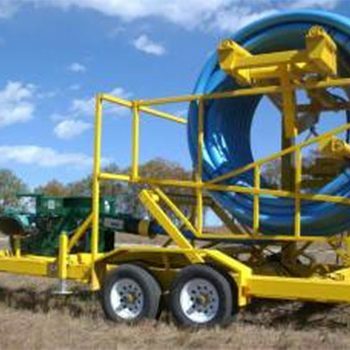 The 4″ HDPE, SDR 11 is delivered in 600ft rolls, weighing 1,200 pounds and is pulled through a machine called a LineTamer to remove the coil set from the long length of pipe. 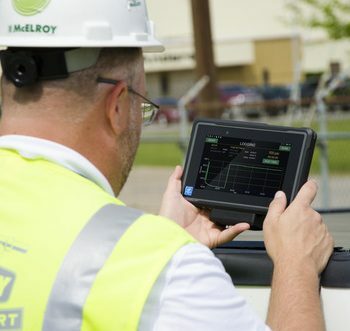 The LineTamer is estimated to cut installation time by a factor of four when compared to using 40ft sections of pipe. 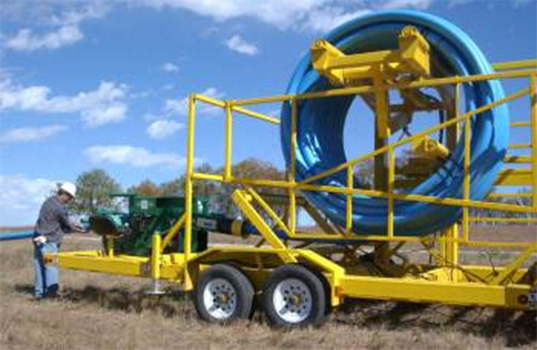 A hydraulic lifting arm on the trailer of the LineTamer is used to lift the massive roll of pipe into a containment cage. The pipe has to be enclosed because it contains stored energy that could be dangerous if not handled properly. A pulling strap is connected to the end of the pipe and is pulled through the LineTamer with a tractor. A series of three rollers bend the pipe slightly beyond a straight line much in the way one would bend a piece of curved wire beyond a straight line to make it straight. The second series of rollers re-rounds the pipe. After the 600ft length of pipe has been pulled through the LineTamer, it is dragged back through the woods toward the lagoon. Five sections of pipe are straightened by the LineTamer and positioned end-to-end along side the open trench until enough pipe is laid out to reach the lagoon. The sections are joined together with a McElroy 14 Pit Bull fusion machine. The Pit Bull fuses 1″ IPS through 4″ DIPS pipe and creates joints that are as strong as the pipe itself. The fusion process only takes about fifteen minutes at each of the five joints and the new fusion operator, that is being trained, only needs guidance on the first joint to perform the rest. After placing the pipeline into the ditch, it is tied to the lavatory and tapped in to the main line that enters the lagoon and the job is complete. 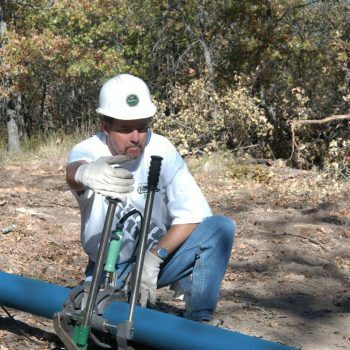 “We have helped the Boy Scouts of America install polyethylene pipe for water lines or sewer lines at three different locations in the State,” said Silkey. “They’re using PE because of its low maintenance. PE doesn’t develop leaks at the joints that have to be repaired like other piping materials. The only time it leaks is when someone digs into it and cuts it.” Many of the scout camps are not used year around so they are more susceptible to the environmental affects of winter. There is no concern with winterizing the camp lines because PE will not freeze and break. 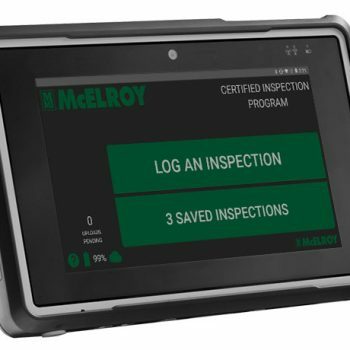 The PE system is also easy to put back into service each year.